Chairman Dave King believes Rangers are five players away from being able to challenge for the Scottish Premiership title next season. 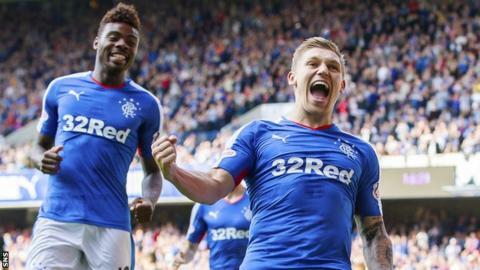 Under Mark Warburton's management Rangers are top of Scottish football's second tier and are unbeaten in all competitions. King believes the current squad are strong enough to win the Championship. And the chairman says he will spend "whatever it takes" to challenge Celtic next year. "My personal view, and Mark might disagree, is that the team we've got in place at the moment will see us off in the league, which was the promise we made - we will win the league this year," King commented. ''What I've indicated to Mark in the last few days is that we can do business in the January transfer window, hopefully that business will not be necessary to win the league this year but should be done with a mind to challenging next year for the Scottish Premiership title. "Our ambition is to start next season competing for the title and be in Europe the following year. "We do understand that we'll have to invest substantially in the squad to compete for the title." King would not put a figure on how much that investment could be. "I've been asked that question about 40 times and the answer is still the same - Mark will get what he needs to compete," King explained. "The squad we have at the moment would be more competitive if it were competing in the Premiership than we'd have anticipated at this early stage. "But do I think what we've got at the moment would compete for the Premiership? I'd say no. "Mark might have a different view, but I'd say we need another five [players], I'd say a minimum of five. ''We would start next season with the intention of winning the Premiership, we understand the gap against Celtic but the ambition is not to come second. We'd go in believing we can win the league." While King insists he is not taking the Championship title for granted, he added: "I'd be extremely surprised if we don't win the league. "Mark has been fantastic, he's come in at short notice without the preparation that he'll have for next season, he had to put that squad together quite quickly with what was available and I think the results speak for themselves." Meanwhile, King indicated there's no need for further investment from shareholders this season unless it is to bolster the playing squad. "At the moment we are well funded through to the end of the season, we are ahead of where we thought we might be. "Season tickets have sold reasonably well and we've had a few full houses. The level of investment will depend on what Mark thinks is necessary depending on what's available in the January transfer window with a view to this season and the next."